News of the death of Marilyn Monroe was announced on August 5, 1962. 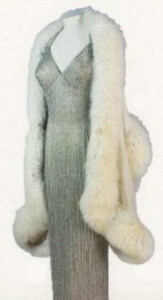 In her will, Marilyn Monroe bequeathed her possessions to her acting mentor Lee Strasberg: “I give and bequeath all of my personal effects and clothing to LEE STRASBERG, or if he should predecease me, then to my Executor hereinafter named, it being my desire that he distribute these, in his sole discretion, among my friends, colleagues and those to whom I am devoted.” When Lee Strasberg died in February of 1982, his estate, which included Marilyn’s personal belongings, passed to his third wife Anna Strasberg. His second wife Paula, who was Marilyn’s close friend and acting coach, had died on April 29th, 1966. In October of 1999, Anna Strasberg sourced Christie’s, the renowned auction company, to sell the bulk of Marilyn’s estate. The auction, which occurred over two days, was labeled “The Sale of The Century,” garnering over $13 million with the sale of nearly 576 lots. Items sold included Marilyn’s clothing, furs and shoes, furniture from her home, film scripts, jewelry, kitchen items, books from her library, cosmetics, awards, and many other items from her private life. 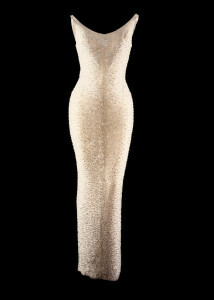 The dress Marilyn Monroe wore to sing Happy Birthday to President John F. Kennedy on May 19, 1962, sold at this auction for nearly $1.3 million, and at that time obtained the title and record for being the most expensive personal dress ever sold at auction, a record formerly held by one of Princess Diana’s gowns. Marilyn’s “Happy Birthday Mr. President” dress sold again in 2016 at Julien’s Auctions for an astonishing $4,810,000.00. Interestingly, the costume Marilyn wore in The Seven Year Itch subway scene sold at auction in 2011 with a hammer price of $5.6 million. However, that costume has never been seen again, and it’s believed the auction transaction may have actually fell through. An array of items that Anna Strasberg donated to Hollygrove, Marilyn’s childhood orphanage, were auctioned through Christie’s Los Angeles in September of 2001 to help raise funds for the facility. In June of 2005, Anna Strasberg sold another portion of Marilyn Monroe’s estate through Julien’s Auctions, achieving yet another seven-figure result from several hundred auction lots consisting of Marilyn Monroe’s personal property. The final auction of items directly from Marilyn’s estate took place in November of 2016, also at Julien’s Auctions, with nearly $11 million in total sales. Many of the items that make up the Marilyn Monroe Collection came directly from Marilyn’s estate via the above mentioned auctions, and others. In some cases, friends of Marilyn herself have actually donated items to the collection. Today, due to her popularity and longevity, Marilyn Monroe is one of the most sought after celebrities in the world of celebrity property and entertainment memorabilia collecting. Items from her estate continue to sell at auction, and the value of her personal property continues to increase. 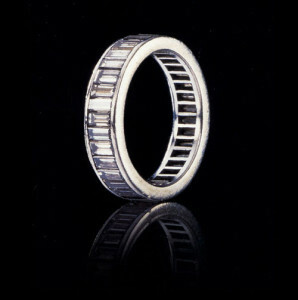 To view items sold at the 1999 Christie’s auction, The Personal Property of Marilyn Monroe, click here. If you wish to buy, sell or trade Marilyn Monroe memorabilia, visit the Marilyn Monroe Collection’s “Buy, Sell, Trade” Facebook group here.